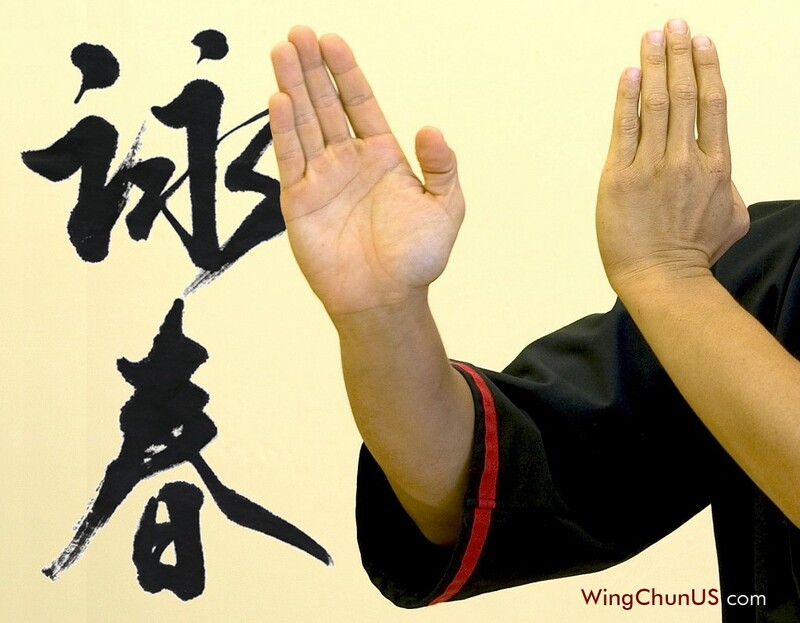 I’m going to discuss a method of WingChun training which we call Form. There are four Forms in our system, each with its own range and quality of movement. The first Form, Siu Nim Tau, focuses your intention and power into a single technique. The second Form, Tsum Kiu, coordinates all four limbs into asymmetrical combinations. The third Form, Biu Jee, teaches torso dynamics. The fourth Form, Mok Yan Jang, increases the synergy of your whole body. These are generalities but give you an idea of our Form objectives. Now, to get the best results from Form practice, what should you keep in mind? Each of your muscles, bones and joints have unique physical actions. Animals like snakes have fangs, bulls have horns and eagles have claws. Studying your human anatomy as diverse weaponry is one purpose of Form. You learn how to move your body to effectively protect itself. For each technique in a Form sequence, I suggest you remember the following: its meaning, action and function. Every technique has a name. An example is Tan Sao. Don’t worry about the exact pronunciation or spelling. However, knowing the translation gives you a clue to its use. For instance, Tan Sao means “Spreading Arm”. This indicates the way it disperses the force of an attack. There are three phases per technique. Compare this to a race defined by a start line, finish line and sprint between them. Similarly, articulate the starting position, ending position and intervening transition of a specific technique. We can describe this process as preparation, execution and termination. In terms of Tan Sao, I use the labels pre-Tan, Tan and post-Tan, respectively. Pre-Tan places your forearm in front of your chest. Tan extends your shoulder and elbow forwards. After several inches, post-Tan stops your arm. Finally, you need to understand how each technique applies to Self-Defense. This also has three aspects. First, what part of your body does it protect? Second, what is your striking surface? Third, what is the optimal target? Tan Sao prevents a punch from impacting your face by using the radius of your forearm to block the ulna of an opponent. I realize that this is a lot to consider for not only Tan Sao, but all techniques in a whole Form. So, at first, you may forget some of the above criteria. That is absolutely ok. Eventually, everything will come together. It just takes confidence, diligence and patience — from both you and your teacher! As long as you don’t give up, you will eventually master the Forms. This entry was posted in Articles and tagged Biu Jee, Biu Jee Form, Darting Fingers Form, Mok Yan Jang, Seeking Bridge Form, Sifu Paul Wang, Siu Nim Tau, Siu Nim Tau Form, Small Intention, Spreading Arm, Tan Sao, Thrusting Fingers Form, Tsum Kiu, WingChun Application, WingChun Forms, WingChun Podcast, WingChun Power, WingChun Punches, WingChun Technique, WingChun Techniques, Wooden Dummy, Wooden Dummy Form by Sifu Paul Wang. Bookmark the permalink.